Increased enthusiasm for a China-U.S. trade deal lifts investors out of a deep depression. Is the optimism misplaced? Check out the latest Century Aluminum, AK Steel, United States Steel, and Cleveland-Cliffs earnings call transcripts. Stocks were up across the board today on the heels of upbeat U.S. jobs data in December, comments from Federal Reserve Chairman Jerome Powell on the strength of the domestic economy, and optimism for a meeting between trade officials from the United States and China in Beijing on Jan. 7 and 8. That last one helped boost shares of industrial-materials stocks by double digits today (the last trading day before the meeting). Most stocks in that category turned in an awful performance in 2018 as the trade war progressed. Today, shares of Century Aluminum (NASDAQ:CENX) rose nearly 16%, while AK Steel Holding (NYSE:AKS) gained almost 17%, United States Steel (NYSE:X) was up 11.1%, and Cleveland-Cliffs (NYSE:CLF) gained 13.2%. As of 3:38 p.m. EST on Friday, each stock had held on to the bulk the day's gains. While the catalyst is plain to see, are investors getting a little ahead of themselves? Aluminum, steel, and iron ore companies -- all operationally tied to the global economy and global trade flows -- had a rough year in 2018. Wall Street's near-termism didn't allow the market to sit back and wait to gauge the impact from tariffs on imports of industrial materials into the United States. Instead, shares of industry leaders only seemed to decline as tariffs ramped up throughout the year, despite encouraging data at the end of last year indicating that tariffs were having the intended effect of curbing imports of underpriced foreign materials. Consider how the four stocks listed above have fared in the last 12 months. Wall Street wasn't entirely to blame. Rising raw-material costs for the aluminum value chain have hampered progress for smelters such as Century Aluminum, which reported a disappointing third-quarter 2018 performance. Meanwhile, several domestic steel companies rely on costly and somewhat outdated manufacturing processes, which makes it more difficult to compete with peers that use newer, lower-cost arc furnace technology. AK Steel and U.S. Steel top the list of inefficient steel producers. 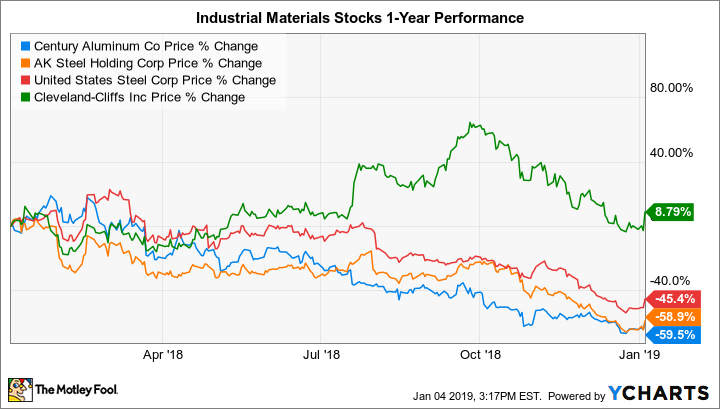 Raw materials producers, including parts of the vertically integrated business of Alcoa (for the aluminum value chain) and the business of Cleveland-Cliffs (for the steel value chain), have fared a bit better in the last 12 months. Cleveland-Cliffs was one of the few industrial-materials companies to deliver stock gains in 2018. Investors have been increasingly optimistic that its high-purity iron-ore raw materials could be in high demand as China looks to gobble up high-quality ores as a way to reduce air pollution. So, if tariffs are beginning to work for domestic industrial-materials suppliers, then why are shares rising today on hopes that a trade-war breakthrough could be around the corner? There are multiple explanations. First, given the beating many industrial stocks took in 2018, they're ripe for large swings on even the faintest whiff of optimism. Second, the underlying reason for the sector's decline has been uncertainty, not necessarily the trade war itself. A resolution would help to reduce uncertainty and provide more assurances to investors going forward. Third, the United States is holding all the cards in trade negotiations, so if the Trump administration sees things through, then it should result in greater market share for domestic companies. That might be a big "if." Today's rising stock prices appear to be more of a case of a rising tide lifting all ships, rather than a well-earned bump in share prices caused by concrete developments. After all, the much-ballyhooed trade negotiations taking place next week only involve vice ministers from the United States and China. In other words, the meeting is unlikely to result in any absolute resolution in the trade war. Individual investors can likely expect more volatility -- and more uncertainty -- in the near term.